The IBM S/390 Partners in Development (PID) organization provides several prepackaged S/390 operating systems for its members. This IBM Redbooks publication is about one of these, the OS/390 (or z/OS) Application Development CD-ROM system, commonly known as the AD CD-ROM system, or simply the AD system. (Equivalent systems have been produced for VM/ESA and VSE/ESA, but this book concerns only the OS/390 and z/OS version.) The AD system is a straightforward implementation of OS/390 or z/OS, plus a selection of other products. The CD-ROM portion of the name reflects the fact that these systems are distributed on CD-ROMs. This document discusses the most recent AD releases, including basic planning for system administration. The bulk of the document consists of "how to" articles that may be useful to new users and owners. It does not attempt to provide comprehensive coverage of any topic, but it does address many common queries and situations encountered by new users. 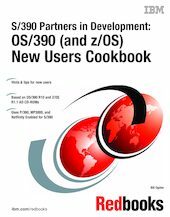 Users completely new to S/390 and OS/390 (or z900 and z/OS) will require initial education before using this document. The PID organization offers periodic classes for users completely new to S/390 and OS/390. Most of the tips and techniques described in this document are not limited to the AD system, and should apply to any smaller OS/390 implementation. However, the specific examples included are based on the AD system.